By God’s mercy, we embark upon the new 2018 calendar year. We cordially wish each of you, as you open this calendar, spiritual and physical health, as well as peace and prosperity to our Divinely-preserved Fatherland, and every Russian Orthodox person, wherever found, in this, “the acceptable year of the Lord” (Isaiah 61:2, Luke 4:19). This year’s calendar is devoted to the 100th anniversary of one of the greatest tragedies in Russia’s history; it was in fact a global catastrophe, for the fate of the created world itself was changed. Specifically, it was the brutal murder of the Holy Royal Passion-Bearers—Tsar-Martyr Nicholas II Alexandrovich, His August Family, Holy Grand Duchess Elizaveta Feodorovna and those with them. This was not “simply” a murder of a head of state, a leader of a ruling class. The Orthodox Russian Tsar is the Anointed of God, and his power is established by God. That is why when “the Restrainer” was removed, then “the Wicked was revealed” (2 Thessalonians 2:7-8), the foundations of the world were shaken, and millions of victims fell after the murder of the Russian Tsar, not only in Russia, but throughout the world. By Divine will the holy relics of St Elizabeth, known in the Fatherland today as “St Elizabeth of Alapaevsk” (denoting the site of her receiving her martyric crown at the rabid hands of the servants of Satan), and her faithful companion Nun Varvara (Yakovleva), have found rest in Jerusalem since January 1921, in the Russian site of St Mary Magdalene Church in Gethsemane. The 2018 calendar contains brief notes about the tragedy, and photographs and icons of the Holy Royal Martyrs and those who were martyred with them, as well as images of a few churches connected with their sufferings and glorification. By the mercy of God, we are issuing a new calendar for the year 2017. 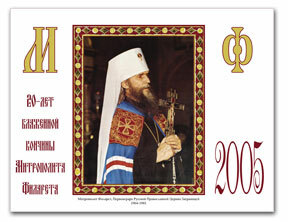 First of all, as is fitting, we sincerely desire that each person who opens our calendar will receive health and strength of soul and body from the Lord, and that our divinely saved homeland, and each Orthodox Russian wherever he may be, will enjoy peace and prosperity during the forthcoming “acceptable year of the Lord” (Is. 61: 2; Lk. 4: 18). This year, our calendar is dedicated to the centennial anniversary of the historic tragedy that changed the fate not only of Russia, but of the whole world. The overthrow of the government (the “February Revolution”) in 1917 and the subsequent abdication from the throne of the martyred Tsar Nicholas II Alexandrovich, will be discussed: Was this abdication juridically legal? Yet we must look truth in the eye: the sovereign divested himself of supreme authority when literally the entire leadership, military and civil, who by oath were bound to be the first to support their tsar, abruptly disavowed him, subjecting the anointed of God “to betrayal” (Mt. 26: 2). Many saw, and still see, in the abdication of the martyred tsar what is tantamount to weakness of will. But his exalted sense of responsibility, his readiness for self-denial, governed his actions: the sovereign acted as he did to avoid bloodshed and further upheavals among the people, as his traitorous entourage assured him. “There is no sacrifice which I will not make for the genuine good and salvation of my native Mother Russia”, the Tsar declared in the telegram he sent to Michael Vladimirovich Rodzianko. “Vile slander had shaken the Tsar and even the trust placed in Him by a significant portion of Russian society,” said St. John of Shanghai, “and the ensuing, artificially stirred up turmoil was not repressed by either the authorities or society. Faint-heartedness, cowardice, treason, and betrayal in all its fullness were displayed by them. Many made haste to seek the trust and favor of the criminals who had come into power.” All that happened later was the direct result of the revolt of February-March. Yet in those times, which were, one may say, the apotheosis of betrayal, the wondrous “ Ruling ” Icon of the Mother of God was revealed to us as a sign of hope for the repentance and rebirth of the Russian nation and the Russian Orthodox government. In our days, by God’s mercy, this promise is beginning to be fulfilled. 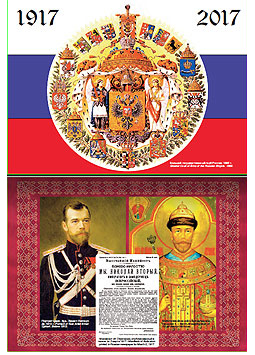 Our calendar for 2017 contains brief accounts of the holy Tsar Nicholas the Passion-bearer, historical photographs, as well as views of several churches dedicated to the Ruling Icon of the Mother of God and several other icons through which were manifested Divine protection over the Russian peoples. By God's mercy we are entering upon the new calendar year of 2016. As is our wont, with heartfelt desire we firstly wish that the Lord may grant health and strength of soul and body to each of you who opens our calendar, peace and prosperity to our divinely saved homeland and to all Russian Orthodox people, wherever they live, during the forthcoming "acceptable year of the Lord" (Is. 61:1-2; Lk. 4:18). 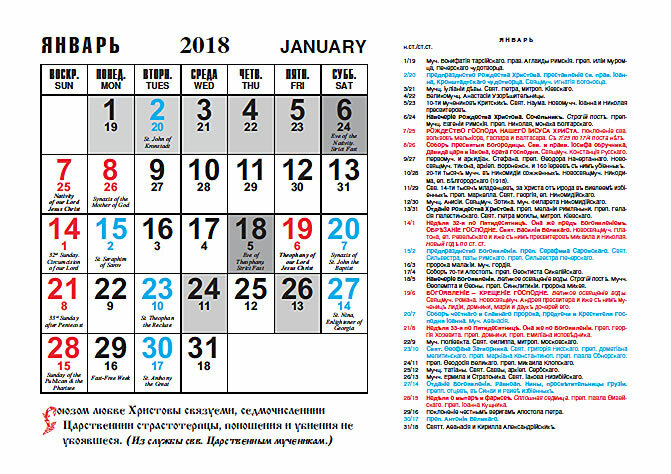 This year, our calendar is dedicated to one of the most striking and tragic events in the history of our homeland, which is as decisive for the history of the Russian Church as it is for the fate of Russian civilization as a whole. We are speaking of those who shone forth in holiness during the persecutions raised against the Church of Christ in the 20th century: the new martyrs and confessors of Russia. 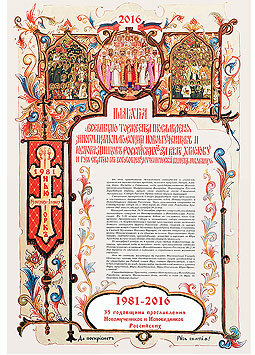 The year 2016 marks the 35th anniversary of the glorification of the host of the new martyrs, which our Russian Orthodox Church Abroad celebrated in 1981. It should be noted that the ecclesiastical diaspora prepared for this event with particular thoroughness over a period of several decades. It pleased the Lord to assign to the little Church Abroad that special task which, under other circumstances, would have been the sacred duty of the whole Church of Russia. It fell to the Church Abroad to anticipate this great spiritual triumph for all of Orthodox Russia. We believe that the glorification of 1981, through the prayers of the holy new martyrs and confessors, hastened the approach of the new times, when, in the words of His Holiness, Patriarch Kirill of Moscow & All Russia, the Lord transformed His wrath into mercy for our homeland. Just as, because of our sins in abandoning the piety of the Church, the Lord permitted the Church, which He Himself had established and the form of government which had been sanctified by His Church in Russia, to fall, and the Church endured persecution, so today, by God's mercy, our people, in greater and greater numbers, the sons and daughters of Russia, are returning to the fold of the Church. All throughout the land of Russia more and more new churches of God are being erected, and the very life of the Russian nation is its everyday reality is beginning to coincide with the life of the Church. The holy new martyrs and confessors of Russia begged the Lord and His all-pure Mother to take pity on our homeland, and now they pray unceasingly in our behalf. They strengthen us with their own steadfastness, that we may overcome each and every deception and machination of those who hate Christ. They teach us by their meekness, patience and love. 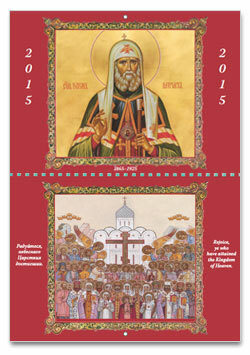 The 2016 calendar contains brief biographical information, photographs and icons of the holy new martyrs and confessors of Russia, as well as views of several churches erected in their memory. By the grace of God, we are entering upon the new calendar year of 2015. Following our longstanding tradition, we take this opportunity to express our heartfelt desire that everyone who opens our Calendar may receive from the Lord health and strength of soul and body, and that our divinely saved homeland, as well as to each Orthodox Russian, wherever he may be living in this "acceptable year of the Lord" (Is. 61: 2; Lk. 4: 19), may receive from Him peace, tranquility and prosperity. This year, our Calendar is dedicated to one of the greatest saints of the Russian land among those who shone forth during the terrible years of the persecution of the Church of Christ in the 20th century: we are speaking of His Holiness Tikhon, Patriarch of Moscow & All Russia. The holy hierarch departed to the Lord of 25 March/7 April 1925, the feast of the Annunciation of the all-holy Theotokos, ninety years ago. Saint Tikhon (whose secular name was Basil Ivanovich Bellavin), was born on 19/31 January 1865, in the Klin settlement, Kun'nsk region, Toropets County, in the Province of Pskov. As God so willed, he ascended the throne of the Patriarchs of Moscow, which had been vacant for nearly two centuries, at the beginning of a new era of troubles for Russia. At that time, because of our sins, the Lord permitted the authority, which had been established by Him Himself and His Church, to fall. In its place arose an authority inimical to God: the authority of those who hate Christ and His Church. The ministry of Saint Tikhon as a confessor of the Truth became, perhaps, the most difficult in the history of the Church, but the Patriarch showed the way to salvation for both Russia and the Church by opposing the power of evil with the power of saintliness. For many this seemed impossible under the prevailing conditions. Yet the will of God triumphed over the plots of those who, deceived by Satan, fought against God. Witness to this is the current rebirth of the Russian Orthodox Church in the homeland and in diaspora. Patriarch Tikhon fearlessly named the era through which Russia was then passing "a time of God's wrath". Thus, one of his early epistles, dated 19 January/1 February 1918, resounded with anxiety over the state of the Church of Russia and condemnation of violent bloodshed. By his preaching and steadfast confession of the Truth of Christ, by his unwavering opposition to those who hate His Church, Saint Tikhon provoked the rabid malice of those who fought against God. At times they cast His Holiness into prison; at times they kept him under "house arrest" in the Donskoi Monastery. The life of the Patriarch was constantly under threat, and because of this his death is considered by many to be a martyrdom. We should remember also that the holy hierarch, as bishop of the Diocese of the Aleutians & North America, was a founder of Orthodox Russia in America. In his time, the Sovereign confirmed the report delivered at the Sacred Synod of the Russian Orthodox Church concerning the transformation of the Diocese of Alaska into the Diocese of North America. At the suggestion of the future Patriarch, the diocesan see was moved to New York, where, under his supervision, the Saint Nicholas Cathedral was erected in Manhattan. In 1905, through his efforts, the first theological school was organized in North America, and with his active participation the translation of liturgical texts into English was undertaken. During his tenure, scores of new churches were opened in the United States. In our days, when lands historically part of Russia are being shaken by new troubles and civil strife, may the prayers of Saint Tikhon the Confessor, who stands now before Christ and His all-pure Mother, protect our homeland and our Orthodox people from tribulations and disorders. 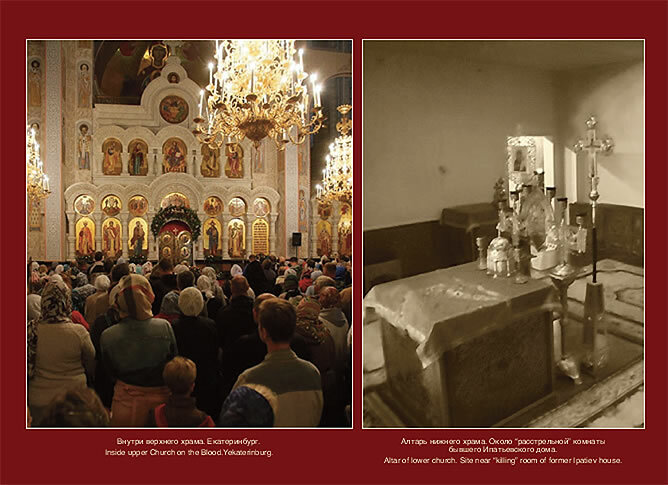 Our 2015 Calendar contains a brief account of Saint Tikhon's life, photographs documenting times in his confessional ministry, as well as views of several church associated with him. "May my name perish in history…"
After Peter I, societal life in Russia began diverging from the Russian path, losing partly the clarity of consciousness of what is right, a clear faith in the Gospel truth: "Seek ye first the kingdom of God and His righteousness." .e severe sufferings of the Russian people are a consequence of Russia's betrayal of itself, of its path, of its calling, St. John of Shanghai said in one of his sermons. 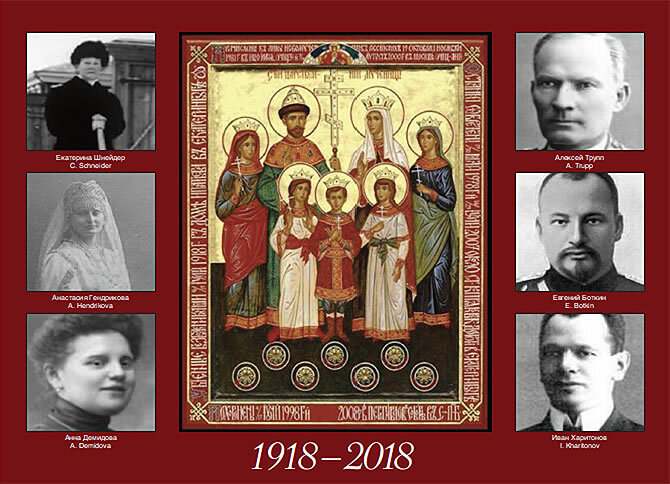 When, almost a century ago, catastrophy befell Russia, the Russian people remembered the long lost commemoration of the feast of All Saints of Russia, and restored it at the All- Russia Church Council of 1917-1918. .is was a step back to their sources, toward the reality of the holy martyrs, icons, sacraments, blessings, prayers. .is was the path chosen by the martyrs and confessors of recent times, the path chosen by Patriarch Tikhon and others who found their own authentic God-chosen place and work in life. In 1981, the Russian Orthodox Church Outside of Russia unreservedly glorified on earth those, whom God had already glorified in heaven - the new-martyrs of Russia along with Patriarch Tikhon, the confessor. 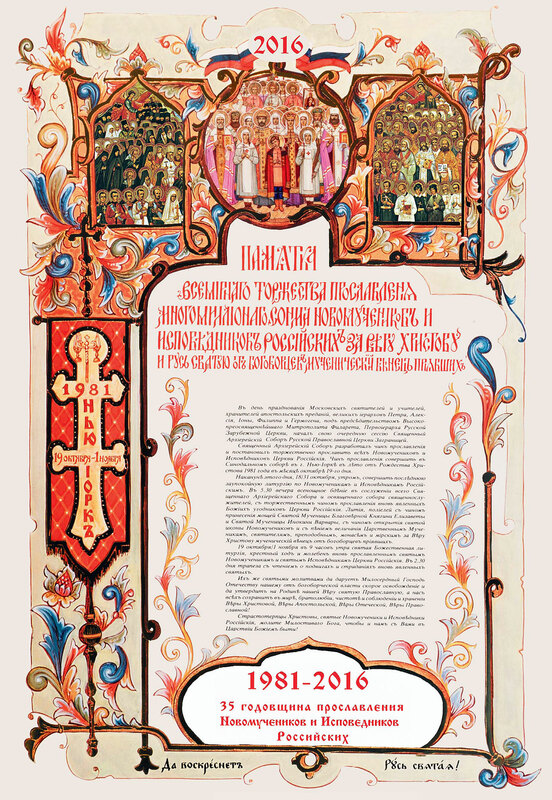 And in 1989, the four hundredth anniversary year of the establishment of the Russian Patriarchate, His Holiness, Patriarch Tikhon, was glorified by the Russian Orthodox Church. In 2000, at the celebration of the turn of the millennium during the Council of Bishops, the glorification to the choir of the saints of a host of new martyrs and confessors turned a page on the terrible era of militant atheism. .is glorification, which declared to the world the magnificence of their struggle, testifies to a profound awareness of the tragic mistakes and painful errors of the people. Among this host of saints, the holy hierarch Tikhon, Patriarch of Moscow and All Russia, stands out. Persecution by those who fought against God in the 20th century subjected Patriarch Tikhon to incomparable tortures. He burned in the fire of spiritual torment every hour and was torn apart by the questions: How far can one give in to the atheist regime? Where is the boundary where one is obliged to place the good of the Church higher than the prosperity of his nation, higher than human life, moreover not one's own, but the life of the Orthodox faithful? In nowise was he ever thinking of his own life, his own future. In the words of Archimandrite John (Krestiankin), the Patriarch was himself prepared to perish on any given day. "May my name perish in history, if only it does the Church some good." is is the measure of struggle; this is the measure of true ministry. He followed his divine Teacher to the end. In his last sermon, the Patriarch calls out: "Follow Christ! Do not betray Him! Do not give in to temptation! Do not destroy your soul in the blood of vengeance! Do not let evil triumph; conquer it with good!" In contrast with many of his contemporaries, during the years of the bloody Civil War he was able to rise above human passions and emotions and amid incredibly grievous conditions make a purely spiritual assessment of what was happening. By his struggle he showed the path of salvation both to the Church and the homeland: to the raging elements of evil one can oppose only the power of holiness; and Patriarch Tikhon, and following him the host of the new martyrs and confessors of Russia, did this. This year, our calendar is dedicated to two great saints of the 20th century, both of whom bear the ancient and glorious name "John", one of the most widespread among the Russian nation. Translated from the biblical language, it means "God has mercy". The first of these in point of time is the holy and righteous batiushka John of Kronstadt (1829-1909), the pastor and wonderworker of all Russia, who was glorified by the Lord even during his lifetime, was canonized by the Russian Orthodox Church Abroad fifty years ago, in 1964, and subsequently, in 1990, by the whole Russian Orthodox Church. The second is the holy hierarch John of Shanghai and San Francisco, who has been called "the wonderworker of the latter days" (1896-1966). Archbishop John was entered in the roster of the saints by the Russian Orthodox Church Abroad twenty years ago, in 1994, and was glorified for Church-wide veneration by the Council of Bishops of the one Russian Orthodox Church in 2008. In addition to their name and the significant round number, one may say, dates of their glorifications, which we are observing this year, there is spiritually a great deal in common between these great saints of God: they were given the special gift to hold in their merciful hearts an inexhaustible and abundant compassionate love for their flock, for every person, in whom they perceived with spiritual sight the image of God. For this reason both were unfailingly charitable to all in need of help; both constantly concerned themselves with the sick, the orphaned, the lonely; both received communion of the Holy Mysteries of Christ daily; and both, being glorified by God, were shown to be—and are still shown to be to this day—a source of most wondrous miracles. In our times, when the mockery of the very basics of the world created by the Lord has become commonplace, these wondrous saints of God remind us of what the essence of the life entrusted to us consists. In our calendar for 2014 we are providing brief accounts of Sts. John of Kronstadt and John of Shanghai, as well as photographs relating to them and views of several churches built in their honor. 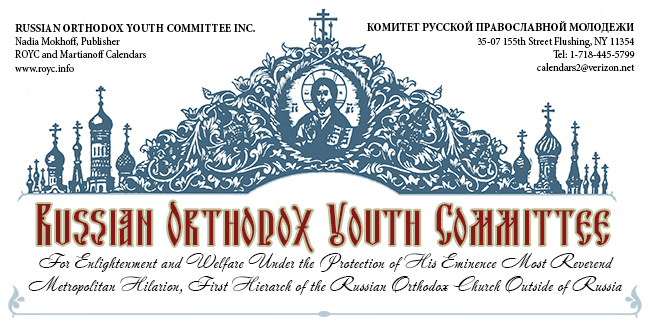 Most Honored Benefactors of the Russian Orthodox Youth Committee! 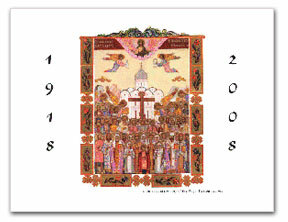 By the mercy of God, the new calendar for 2013 has been issued, and we fervently desire for each of you health and strength of body and soul, together with peace, tranquility and prosperity for our divinely saved homeland and every Orthodox Russian, wherever he may be in this "year that is well-pleasing to the Lord(Is. 61: 1-2; Lk. 4: 18). This year, our calendar is dedicated to a date that is both great and tragic for our history—the 400th anniversary of the Romanov Dynasty. Monarchy is a system of government asked for and received from God, as we find recorded directly in the Sacred Scriptures. Unfortunately, because of our sins, our nation has been deprived of this grace-filled structure of earthly life, under which Church and State have striven for harmonious synergy. Beginning from February of 1917, the Russian throne has lain vacant; yet loyalty to the decisions of the Council of 1613 was sealed with the blood of the imperial passion-bearers. We trust that if we Russians are penitently aware of what we have lost, we will return to our roots and the piety of our forefathers, the founders of Holy Russia, and that the Lord will return to us what has been lost, if, of course, we are worthy of it. During the rule of the Romanov Dynasty the Tsardom of Russia began to be transformed into the Russian Empire. Today, people have differing attitudes toward the Monarchy and the Empire as such, yet each must acknowledge that during the three hundred years of its existence, the greatest attainments were achieved in the life of Russia, be they in the fields of literature and art, church-building, governmental development, or victory over the enemies of the homeland. In the remarkable words of the prominent thinker of the Russian Diaspora, Archimandrite Constantine (Zaitsev), "…The value of Russia, as a whole, is defined by the basic spiritual deposit which it acquired at the dawn of its existence, as the locus of Orthodox culture." 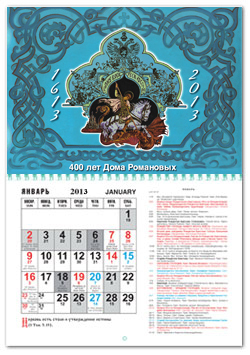 In the 2013 calendar we are including brief accounts and depictions of churches erected by members of the Romanov Dynasty. 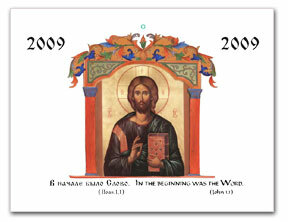 By God's great mercy, we have successfully managed to reach the conclusion of the 2011 calendar year. It is my prayerful desire that the coming New Year bring with it gifts of grace from our Lord Jesus Christ, health of body and soul, peace and prosperity to our divinely saved homeland and to every Russian Orthodox Christian, in the homeland and in the Diaspora. 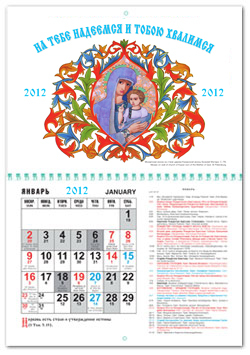 Our Youth Committee Calendar for 2012 concentrates on the theme of Russian churches dedicated to the Mother of God. Must one really point out that there are a vast multitude of such churches in Russia? It can hardly be otherwise, for from its origin Holy Russia has itself borne the wondrous title "The Home of the All-holy Theotokos". All of Russian history, in God's providential, spiritual plan, constitutes the thorny path prepared for our homeland as the Home of the All-holy Theotokos. This task, entrusted to the Russian people by the Lord, has been far from easy. Over the past millennium, temptations and stumbling-blocks have risen against Russia, caused by enemies, visible and invisible: to reject its destiny in favor of one or another "advanced" idea; to forget Holy Russia, the Home of the All-holy Theotokos; to "unite with progressive civilization." And every time, we have had occasion to lament grievously our thoughtless readiness to give in to these temptations. And today, this question again confronts us with particular power. "Having experienced all the difficulties of life on earth, the Helper of the Christian race beholds every tear and listens to every groan and entreaty addressed to her, Especially close to her are those who struggle to wage war against the passions and are zealous for the God-pleasing way of life. Yet even amid the cares of life she is a speedy helper," St. John of Shanghai and San Francisco once wrote. "The Joy of all who sorrow, the helper of the oppressed, the feeder of the hungry, the consolation of travelers, the haven of the tempest-tossed, the visitation of the sick, the protection and aid of the weak, the staff of old age, the Mother of God Most High, art thou, O all-pure one" (sticheron of the Directress). She is "the hope, intercession and refuge of Christians," and "the Theotokos tireless in her supplications" (kontakion of the Dormition), "who saveth the world by her constant entreaty" (theotokion of Tone III). 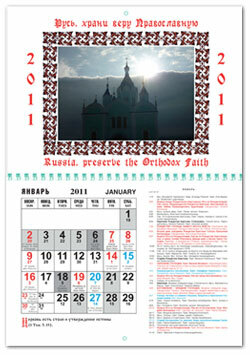 Our calendar for 2012 also contains the sermon of St. John of Shanghai on the Orthodox veneration of the Mother of God and short histories of the ancient and new churches and monasteries dedicated to the Theotokos in Russia. as well as pictures of these churches. right honorable benefactors of the Russian Orthodox Youth Committee! By the mercy of God we have been deemed worthy to live to see the new calendar year 2011. We earnestly desire for each of you strength and health of soul and body, long life, peace and tranquility throughout this new and "acceptable year of the Lord" (Is. 61: 1-2; Lk. 4: 18). The words “Russia, preserve the Orthodox faith” are well known to most of you. But in its fullness it becomes an exposition in brief of the essence of the revelation concerning Holy Russia. At Great Vespers of the feast of All Saints Who have Shone forth in the Russian Land we sing: "O new House of Ephrata, chosen portion, Holy Russia, preserve the Orthodox Faith wherein thou art made steadfast." Holy Russia is God's "chosen portion”. And as the "House of Ephrata," was given to the progeny of Abraham according to the promise, so has Holy Russia been given by the Lord to its inhabitants for them to preserve. Holy Russia is the keeper of Orthodoxy; yet at the same time Orthodoxy itself serves as an assurance of the steadfastness of Russia. Holy Russia is Orthodox Russia. Orthodoxy is the very surety of the existence of our homeland. In our days, this has become obvious to more and more Russian Orthodox people, wherever they may live. The re-establishment of the greatness of Russia is impossible without a renewed dedication to the Church. as well as what pious Russian church authors have to say on this most important topic. 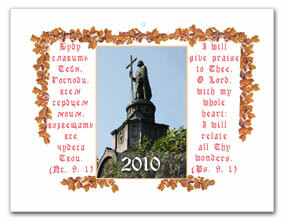 Dear brethren and sisters, honorable benefactors of the Russian Orthodox Youth Committee, beloved in the Lord! By God's mercy the new calendar year 2010 is approaching, and we sincerely desire for each of you health and strength of soul and body, as well as peace and calmness in this "year of the Lord's grace" (Is. 61: 1-2; Lk. 4: 18) . Our ancestors were able to partake of spiritual wisdom from the writings of our holy Fathers due to the work of the holy equals of the apostles Methodius and Cyril, who created slavonic literacy in order to satisfy the needs of the Orthodox divine services. "The light of Christ doth illumine all", and the holy enlighteners of our homeland took pains to carry this light of the Wisdom of God to reach us. By their great labor and struggles our homeland acquired from the Lord the name Holy Russia, the Estate of the All-holy Theotokos. 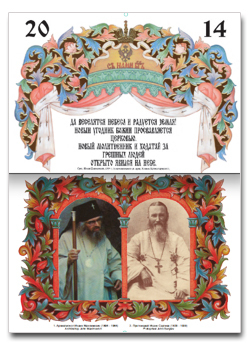 The 2010 calendar recounts the work of the new generations of enlighteners summoned forth by the Lord in place of the older ones - from St. Savva of Storozhevsk, to the righteous pastor St. John of Kronstadt, who lived in the late 19th-early 20th centuries. The mere reading even of abbreviated lives of these holy enlighteners and pre- servers of Russian sanctity, our heavenly mediators and helpers, heartens us, guides us to the path of virtue, which is so essential for us in our complicated times.